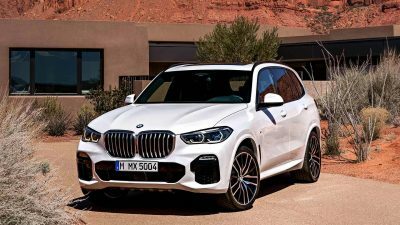 Taking the newest BMW X5 for a drive is breath-taking, and building on its solid mandate for making exciting SUVs the 2019 X5’s ride, handling and comfort are exemplary. BMW have taken great lengths to have the latest BMW X5 smoother, and fitted out with all the mod cons in the luxury model variants. When the SUV rage was at its beginning one of the first SUVs that was actually fun to drive was the very first BMW X5. It offered plenty of power and had the handling to match. Fast forward into the here-and-now and the latest BMW X5 has sculpted into a highly desirable mid-to-large size SUV that’s both attractive and bold. Add BMW’s Motorsport styling to the already powerful stance, and the 2019 BMW X5 is rather gratifying. The first generation X5 was somewhat chunkier than what we have here today. Today’s styling has a smoother exterior with a longer, lower roofline, under which lies more room and comfort. Sleeker lines and sleeker exterior lights adds plenty of flavour to the new X5’s muscle which is very well planted on wide rubber. Stand at the front of the 2019 X5 and you have a powerful and intimidating fascia staring back at you. The chrome-rimmed kidney grille is still huge, but the bumper now incorporates massive air intakes offering loads of intimidating road presence. Having the new X5 bearing down on you in your rear-view mirror would be more than a little intimidating. The standard LED headlights are beautifully sculptured into the design, with the twin DRLs either side taking on their horse shoe pattern for a striking display. Running along the side of the new X5 there is a subtle crease line that measures the length of the vehicle, high up, providing strength and muscle to the otherwise very streamlined silhouette. There is little space between the tyres and the wheel arches giving a superb look of low profile performance; and, of course, the alloy rims are stunning. 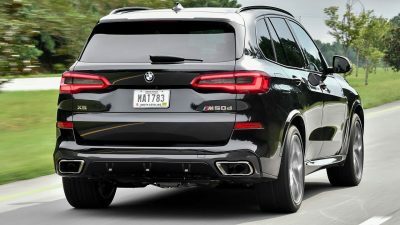 It’s at the rear of the new X5 that there is a bigger change in appearance, with the latest model boasting a very nicely finished back-end with elongated taillights, a tailgate spoiler and twin exhaust outlets. The X5’s tailgate sits even lower, and makes a nice design image as it’s seated into the upper bumper zone. Not only does it look attractive, but from a practical point of view the new X5 has massive luggage carrying capacity. This is BMW’s largest SUV until the new X7 arrives. There is no doubt that the newest BMW X5 has that silkily crafted interior that woos the occupants inside. 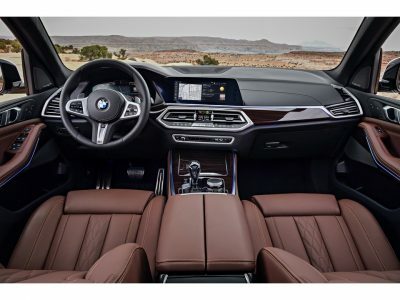 Gorgeous leather surfaces with accented stitching is first class, and there are a variety of contrasting materials, trims and colours to make your new BMW X5 a standout model that says as much about you as it does about luxury/performance SUV motoring. Based on the latest 5 Series, the interior is simply stunning. A massive satellite navigation screen sits on top of the dashboard, and it seems that both BMW and Mercedes are having a go at seeing just how big a dashboard screen you can get comfortably inside the space available! M sport versions get a racier interior with full leather racing seats, a sportier steering wheel and aluminium trim fittings. BMW’s 2019 X5 is loaded with high tech equipment, and if you are into the latest gadgets you’ll love what’s on offer. Two 12-inch high definition displays are standard, and the main dashboard touchscreen has all the bells and whistles. You can control the infotainment touchscreen by voice, gesture, touch or by the latest iDrive control found on the central console. Live traffic update, internet connection, Bluetooth connections and so much more make this new luxury SUV a treat. 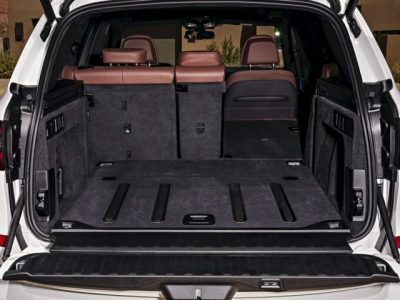 Space wise the 2019 BMW X5 has well over 40 mm more between the wheels, and this translates to much more leg space and interior room – particularly noticeable for those in the back seats where comfort is exceptional. BMW has the X5 designed to cater for seven should you wish to use this as a seven-seater SUV, otherwise the standard five-seater version has a massive 650 litres of luggage space with the rear seats in their upright position (1860 litres with the rear seats folded flat). A boot load shelf can be retracted and hidden away at the touch of a button. Two diesel and one petrol engine are offered for powering the range of 2019 BMW X5 SUVs, with all of them using a well-developed eight-speed automatic. At 198 kW, the X5 30d will likely be the hugely popular model with buyers. You can shuffle through the 0-100 km/h dash in just 6.5 seconds and then cruise around at somewhere in the vicinity of 5-to-6 litres/100 km. Impressive! A BMW X5 M50d is the range topper with a whopping 300 kW available from the high performance quad turbo-diesel motor. Yes, you read that right; four turbo chargers! A 0-100 km sprint in this model takes just 5.2 seconds, and you can also enjoy around 6 litres/100 km on a relaxed day. The one petrol engine is found in the BMW X5 40i which can scamper through the sprint in 5.5 seconds but it comes at a cost to fuel economy. Smooth, creamy performance is part-and-parcel of any of the 2019 BMW X5 models. Road holding and grip are fantastic, and safety has the full Monty five-star rating. The only thing up against the X5 is that the price is relatively high compared with say an equivalent Volvo. For any more information on the new BMW X5 models or, for that matter, any other new car, contact one of our friendly consultants on 1300 303 181. If you’d like some fleet discount pricing (yes even for private buyers! ), we can submit vehicle quote requests out to our national network of BMW dealers and come back with pricing within 24 hours. Private Fleet – car buying made easy!